Like Seth wrote last week, a Subway Series is more fun when both the Yankees and Mets have solid records and are getting attention for all the right reasons. The Yankees were 31-25 as of Friday afternoon, and they entered the series winners of ten out of fourteen. The Mets, meanwhile, entered the series just a week removed from Johan Santana's no-hitter and had just gotten another brilliant start from R.A. Dickey to salvage the last game of their series in Washington. 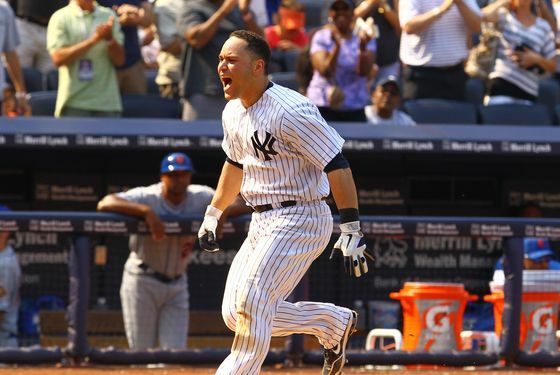 But comparable records do not guarantee an evenly matched series: The Yankees swept the three-game series this weekend, winning yesterday's game on a Russell Martin walk-off. • About that top of the ninth, though: Rafael Soriano blew his first save since taking over as the Yankees' closer following injuries to Mariano Rivera and David Robertson. Some in the Yankee Stadium crowd booed him as he walked off the mound after getting the hook from Girardi. • One more thing about the top of the ninth: It was Ike Davis (current batting average: .167) that drove in the tying run with a double off Soriano. • Yesterday's Yankees win was their first walk-off against the Mets since this happened back in 2009. • The Screenshot of the Weekend award goes to this moment in the Yankees' dugout on Saturday. • The Yankees lead the majors with 92 homers, and the long ball was the difference this weekend: The back-to-back-to-back homers off Santana on Friday gave the Yankees a comfortable lead, Mark Teixeira's hit a go-ahead two-run homer in the sixth on Saturday, and Russell Martin hit two homers yesterday, the first of which put the Yankees on the board (after a David Wright error) and the second of which ended the game. • The Yankees are six games into a stretch in which they play 28 straight games against teams that currently have comparable records to theirs, and they're off to a great start: They're 5-1 so far in games against the Rays and Mets, with a series in Atlanta set to begin tonight at Turner Field. • The Mets, meanwhile, have now lost six of seven. Since Santana's no-hitter, they've won just one game that wasn't started by Dickey.